You have to wonder: if meatloaf is chic again, and fried chicken is the rage, then can Shepherd pie be far behind on the 50’s Classic Comfort Revival Plan? My friend Deborah recently invited us over for Shepherd pie, and it was the first time I’d thought about the dish, well since I contemplated leaving my life of luxury and becoming the high Priestess of the First Feminist Shepherd Temple. And the last time I’d eaten Shepherd’s pie I was in a pub in London, long before the advent of trendy Gastro Pubs, when it was just Pub food. I stood looking at a cafeteria-style steamer tray of bangers and mash, and it not only frightened me, but triggered my gag reflex. Being hungry and determined to try authentic English Pub Food (and still trying to figure out why soggy French fries are called chips) I spied a meaty stew with a topping of browned mashed potatoes. I settled for the Shepherd Pie and hoped it would banish the memory of a banger right out of my brain. This Shepherd pie was a meat stew that was as much whiskey as it was meat and it was wonderful. Since then I’ve tried to resurrect its popularity among the heathens, but it’s like fondue or haggis, either you wind up preaching to the choir of the faithful, or you find yourself all alone on the soapbox waving an empty fondue fork. We couldn’t make it to Deb’s for her Shepherd Pie dinner, but as I was faced with some left over chicken I thought it could be time to update that classic. Donning my treasured and well worn Shepherd outfit, (no, I don’t have a picture) I rounded up all the possible left over items in the fridge (because shepherds are thrifty and never waste leftovers) and wondered how on earth I could pull this together. Now, my dear Urban Husband, doesn’t share my shepherd fantasies and frankly, I was worried I’d be serving Prison Food instead of Shepherd’s Delight. Thinly sliced onions, very gently simmered in chicken stock, with a star anise and a very hot chili pepper thrown in. The onions were sweet, the anise added a hint of spice and the chili pepper a gentle whisper of heat. To keep the party going, I added a good-sized glug of sherry and a small knob of butter. Cleaned the meat off the leftover roasted chicken and gave it a coarse chop, then tossed the pieces in a mixing bowl. I had some brown butter and sage sautéed rutabaga left overs. I know, hard to believe there are leftovers, but it had been a pretty big yellow turnip. They went into the mixing bowl. I took the onions out of the confit juice and added them to the chicken mix, removed the star anise and habanera chili and let the juices reduce into a thick sauce. Oh yeah. Grated a ton of ptarmigan cheese into those spuds and whipped them up. Gently stirring my mixing bowl of chicken, onions and turnip, I placed them in chic little, un-Shepherd like baking dishes. Topped the stew with the parm mashed potatoes, grated some more cheese on top and put the dishes in the oven to bring everything up to bubbling hot. 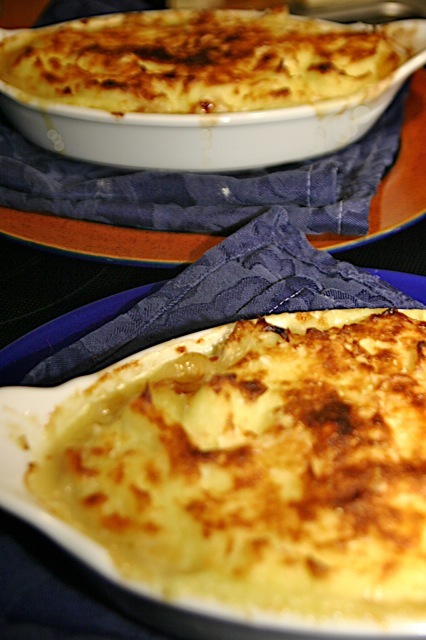 A minute under the broiler to make the potatoes crunchy and the Chicken Shepherd Pie was ready. I set this bubbling rustico dish in front of Urban Husband and I didn’t say too much, even after the quizzical look, which could have been prompted by my Shepherd outfit or because I’d just served him his very own bowl of mashed potatoes. First forkful, second forkful, and then “What is this? It’s good.” Whew, not Prison Food….and yes, it was delicious and I may have made a convert to Shepherds Pie after all.